Since 2015, the Chair of Space Technology offers a new international full-time Master’s programme in space engineering. to become future leaders in the space industry. The Master’s programme is project oriented and focuses on Space System Design, Space Technology, Space Management & Operation and Intercultural Communication. Students have the chance to be involved in challenging space projects, working within intercultural teams, whilst benefiting from the worldwide leading expertise and network of TU Berlin in the field of space technology. A Master’s thesis, either in one of the exciting research projects at the university or with an industry partner, finalises the programme. After two years of study, taught in English, students are awarded a state approved degree “Master of Space Engineering”. 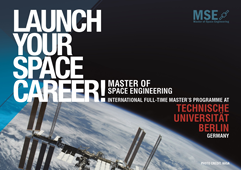 You can find more information about our international Master’s programme in space engineering on the official website www.mse.tu-berlin.de.